i let myself sleep in yesterday, but it wasn’t too late before i was up and about tending to chores and errands. there was much to be done for kari’s upcoming nuptials; it comes as no surprise that i am taking them to the extremes and going a bit over the top. but hey, this wedding is the only one i’m planning on kyle and kari having, so it’s now or never. my first stop was at henri’s bakery to do some taste testing and space scoping. the patio is going to be perfect for our event, and everything just looked and smelled so delicious. javier was incredibly helpful with the design details, and i cannot wait. i had to grab a little treat for myself as i hustled out the door, so i figured a cup of coffee and a chocolate doughnut were good choices. i zoomed up and down peacthree in the mazda as i made my other stops. i cannot share all the specifics now because there needs to be some mystery and surprise! the rest of the morning was a flurry of activity, and it felt great to mark some items off the to-do list. i had just enough time to stop home and gather myself before sarg showed up. he was in the redcoat marching band with me at uga for a few years, and we have been good friends since we met. he and my dear friend lisa actually got married just this june. the couple was beautiful, and the reception was a blast. what more can you ask of a wedding? sarg and i zipped on over to lindbergh to pick up my brother, and then we headed down to orpheus brewing. a fairly new spot in town, orpheus brewing opened memorial day weekend and has been hosting beer drinkers ever since. we were a touch early, as were bank and liz, so we took refuge in the shade as we waited to enter. it was a warm and muggy afternoon (all that rain from friday offered a very brief reprieve from the typical summer weather), and we were eager to slurp down some refreshing brews. the line of patrons grew quickly, and i was glad we would not have to wait outside too long. we swiped our cards, adorned our armbands, and quickly took our glasses and tickets to the bar. i first tried the atalanta, a tart plum saison, which i liked just fine. however, i don’t think a whole pint of it would have been enjoyable. good thing their tasting glasses are small! 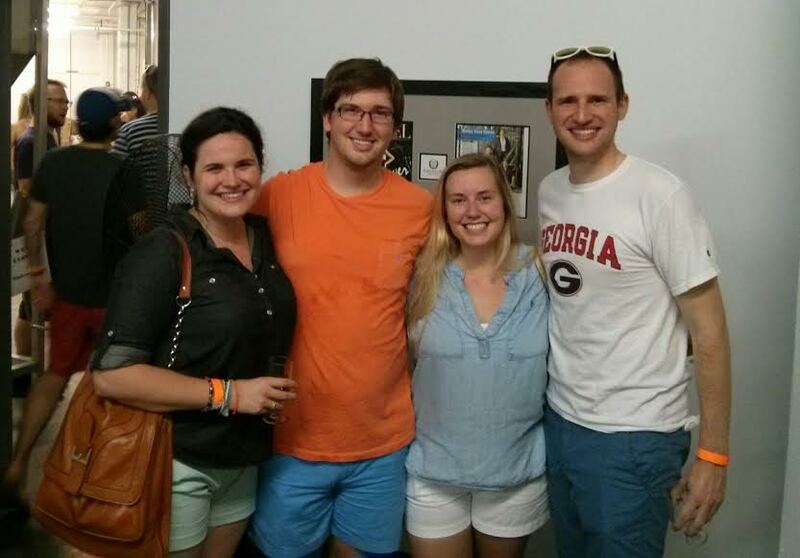 everyone had their first pours, and we were able to snag a hightop around which we could congregate. the inside space at orpheus brewing is not too large, and with the limited number of tables, it’s a good idea to get there earlier so you can grab one for your group. even with folks out on their double-decker patio (which actually is quite nice) and others on the brewery tour, this brewery was still hot. not one person in there wasn’t sweating like a greased monkey, but it is august in atlanta after all. i’d say, though, that our group still managed to have a good bit of fun. you never know who you’ll see or meet when you’re out and about in the city, and kyle and i had the most serendipitous moment of the day: a married couple from auburn saw kyle and thought he was clark! they ended up introducing themselves to us, and we had the loveliest of chats: the wife bonnie knows clark because she is also an accountant, and the husband joe was in the auburn singers show choir with him. such a small world! isn’t it fun to make a couple of new friends? me, joe, bonnie, & kyle. we were easily seated inside, and our waitress kate quickly brought plenty of water for the table. we were parched and hot and desperate to quench our thirst! we didn’t take too long with the menu, either, and a few folks were hungry enough to order starters, myself included. 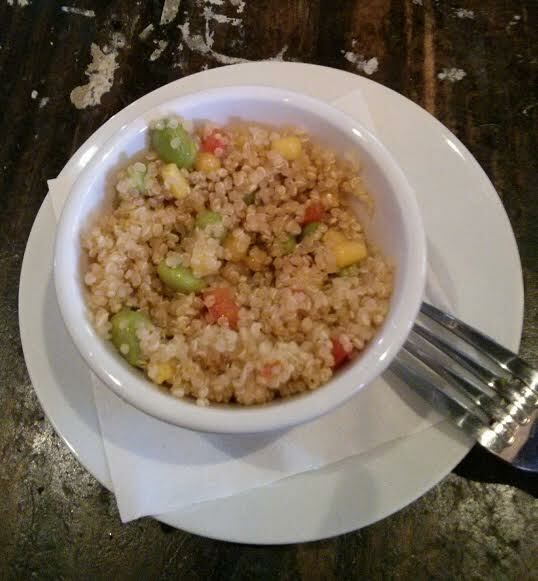 there’s a quinoa salad on the menu, and it proved to be just as delicious as it sounded. it was a small bowl full of light quinoa, red peppers, corn, and edemame. there was the slightest kick of heat, and it was a great dish to tide me over until dinner. the other end of the table shared a plate of soft pretzels with warm cheese and beer dip. i didn’t get a taste, but based on sarg’s face and the empty tray, i’d say they enjoyed them. before too long our early bird dinners arrived. liz and i both ordered the chicken tenders, and i think we were both a little caught off guard. 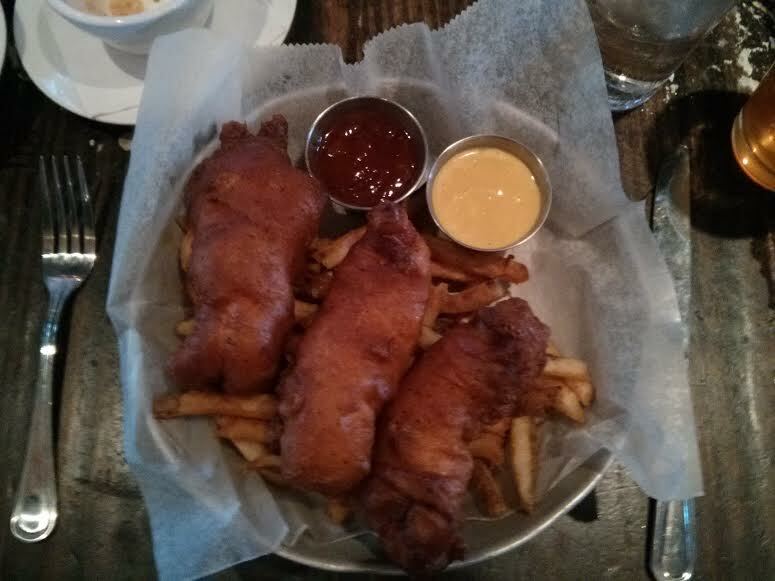 don’t they look like fish’n’chips instead? these were some serious chicken tenders, and you can bet i was full by the time i finished. you can dip it in a habanero honey mustard or homemade beerbq sauce, but because those tenders were so dang hot, i politely requested a ramekin of ranch and went to town. as they cooled off, and as i doused those bad boys, they became quite a filling meal along with those very tasty french fries. 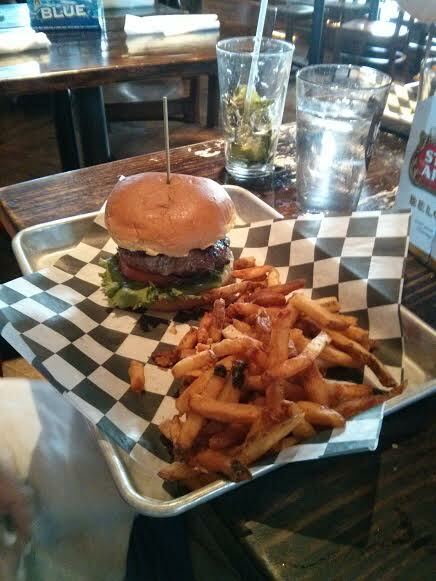 everyone else at the table went with a burger. alison and sarg were very pleased with the lamb burger. 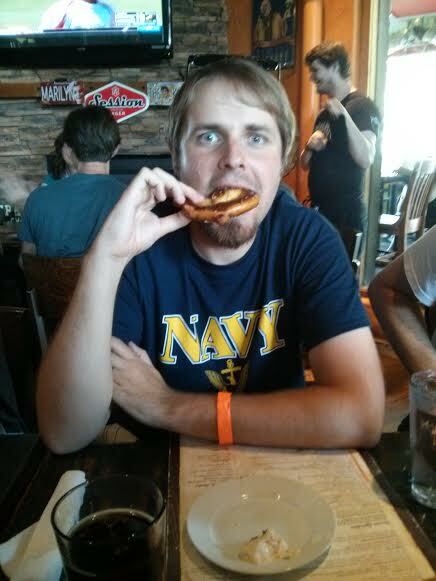 nathan liked the bbq version of the taverner double decker burger. kyle and bank both had the morningside. although kyle liked it just fine, both the burger and egg were a little overcooked to his preference. hobnob is the latest venture by brothers sean and gilbert yeremyan, their start being gilbert’s in midtown. even though they are cultured world travelers from turkey, they have been excited to bring comfort pub cuisine to you with friendly and sincere service. 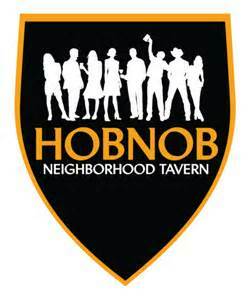 they want hobnob to be your local watering hole where the inviting and comfortable atmosphere and food keep you coming back again and again. i would certainly come back again if someone were to recommend hobnob, but, as it seems to be the trend lately, i will definitely keep trying new places first. 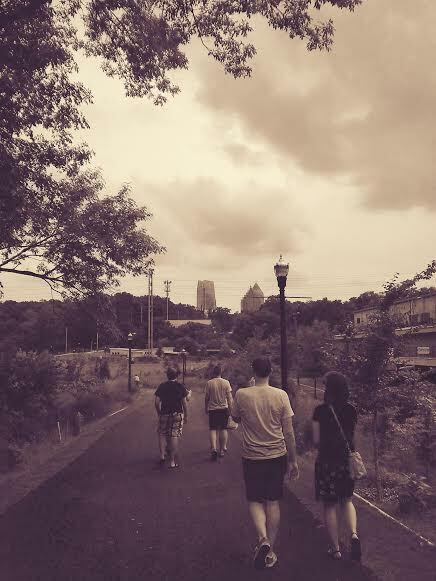 we strolled back to our cars, enjoying a lovely skyline view along the way. it had been a fun and sweet saturday afternoon. good food, good drinks, and even better company. you can bet that by the time we all got home around seven o’clock, though, that we were quite content with calling it a day. man, we’re getting old!